Retro and stylish this 3 1/2 inch peeptoe pump is done perfectly in black shimmer. 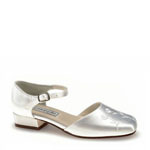 The buckled strap gives the Tessa a youthful look while adding stability. This style is perfect for any special occasion. 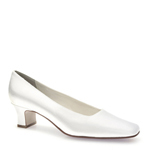 Retro and stylish this 3 1/2 inch peeptoe pump is done perfectly in white satin. The buckled strap gives the Tessa a youthful look while adding stability. 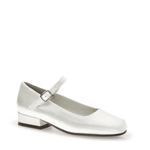 This style is perfect for any bride or bridesmaid.